Skin maceration is a term used to describe the oversaturation of the skin due to a prolonged exposure to moisture. It may be caused by keeping the skin under the water for a long time (bathing, swimming) or preventing the escape of moisture from the skin, such as wearing a bandage for too long or wearing non-breathable materials. While maceration can be often harmless, it may lead to complications in the elderly, in people with wounds, or those recovering from surgery. If left untreated, maceration can cause a bacterial or fungal skin infection that can progress to an all-body, systemic infection. Poor hygiene only adds to the risk. The prevention of skin maceration is ultimately the best form of treatment, precluding the need for antibiotics, antifungals, and specialized wound care treatments. Wrinkled skin is the first and most obvious sign of skin maceration. Most of us are familiar with the wrinkled appearance of our hands and feet after a long bath. Maceration will also cause the skin to be extremely soft and take on whitish coloration. Some of the causes of maceration may be quite obvious, but others may come as a surprise. The excessive build-up of tissue moisture, either through perspiration, urine, or other fluids, is often referred to as hyperhydration. Though risks are associated in all of these cases, they are of a particular note with occlusive therapy and urinary incontinence. One of the most common causes of skin maceration in a medical setting is occlusive therapy. This involves the use of films and other non-porous materials to ensure that a wound dressing is completely air- and water-tight. This not only prevents microbes from entering breaks in the skin, but it can also promote the absorption of medications into tissues. The problem is that, unless the bandage is regularly changed, perspiration and leakage from the wound can rapidly accumulate. Within a short period of time, bacteria can colonize and lead to infection. If the wound is opened, it will be moist and raw with swollen, inflamed tissue. Similar symptoms can occur in elderly people who are incontinent. Unless the urine-soaked clothing and bedding are changed regularly, prolonged exposure can lead to painful and eruptive skin ulcers, particularly in skin folds or where the skin is compressed against the mattress. Maceration will not only accelerate the formation of bed sores, but it can also impede their healing despite aggressive therapy. The damage will generally be centered around the area of pooling. Elderly people are most vulnerable due to the thinning of their skin and a reduced blood circulation (the latter of which impedes the body's ability to fight local infection). While maceration will generally clear up once the skin is dry, any skin that is broken has poor circulation or experiences prolonged hyperhydration may be vulnerable to injury or infection. We refer to this as moisture-associated skin damage (MASD). Maceration can be especially problematic when treating diabetic foot ulcers, leg ulcers, bed sores, and fungal lesions. The fluids from these wounds contain enzymes that actively break down proteins and peptide bonds in the skin, hurting rather than healing the tissue. Unless efforts are made to properly manage the wound—preventing bacteria colonization while avoiding maceration—infection and other complications are likely to occur. Skin infections caused by maceration can progress unless aggressive interventions are made. This can lead to cellulitis (a potentially serious post-operative infection usually seen on the lower leg) or cutaneous necrosis (where tissue death has occurred). Without immediate hospitalization and treatment, death may occur. Septicemia is most often associated with a systemic bacterial infection (bacteremia). By contrast, systemic fungal infections are more commonly seen in people with advanced HIV or organ transplant recipients. Complications occur most commonly in people with compromised immune systems, but can also affect post-operative patients exposed to certain strains of Staphylococcus aureus or Pseudomonas aureginosa. Most cases of skin maceration require nothing more than a little fresh air to help dry the skin. Even if the skin is broken, allowing the free circulation of air around the wound is usually better than keeping it tightly bandaged once a scab has formed. While you may want to keep the wound covered while at work or doing manual labor, all you may need at other times is a little antibiotic ointment. If you have had a serious skin wound or have undergone an operation, you need to follow your doctor's instructions on how and when to change the wound dressing. This is especially important if an occlusive bandage is used. If you follow the care instructions but are still have a spongy or "weepy" wound, speak to your doctor, describing your symptoms in detail. Depending on the amount of seepage you're experiencing, your doctor may recommend that you change to a hydrofiber dressing (which wicks the fluid discharge away from the wound) or an alginate dressing (a carbohydrate-based biofilm designed to absorb heavy wound discharge). If an infection develops, call your doctor immediately, especially if there is fever, pain, a heavy discharge, or a foul smell. Depending on the severity of the infection, you may require a course of topical or oral antibiotics. Iodine-infused gauze pads and dressing may also be used if there is heavy discharge. Leg ulcers are usually treated with elevation and compression stockings to strengthen the veins in the limb. Pain is sometimes difficult to treat if there are ulcerative sores. Beta-blockers, corticosteroids, and nonsteroidal anti-inflammatory drugs (NSAIDs) can all adversely influence ulcer healing. Tylenol (acetaminophen) can usually help in this regard. A lidocaine ointment may also help ease the neuropathic pain. Septicemia requires hospitalization and emergency care. Treatment may involve intravenous fluids, antibiotics, norepinephrine (to control low blood pressure), and corticosteroids (to reduce inflammation). To prevent skin maceration in incontinent adults, always use disposable, absorbent undergarments and change them the moment they are soiled. Avoid caffeinated beverages later at night, which promote urination (but never deprive an elderly adult of fluids to avoid bedwetting). If an accident does occur, wash and dry the skin gently with soap and water. Moreover, check for bed sores or any signs of skin breaks or infection. Powdering the bedsheets can also help reduce the friction against the skin. Bed sores require intensive management. This may involve a saline solution to remove any dead cells and an appropriate moisturizer to keep the skin soft. 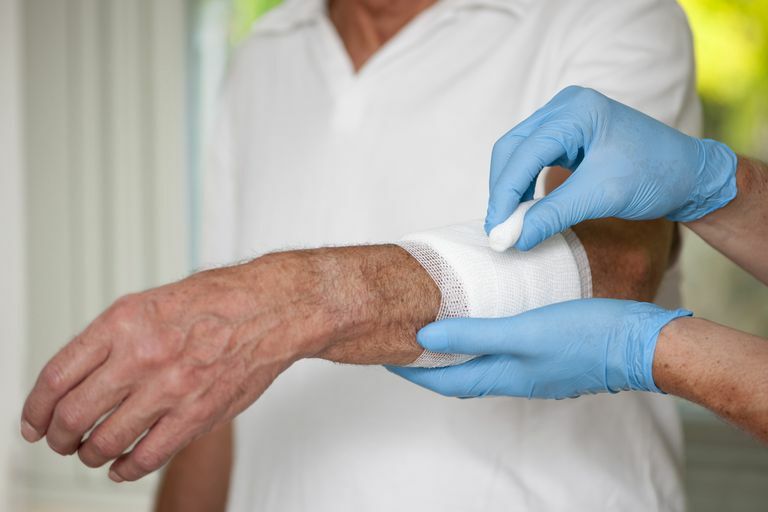 Depending on the size of the sore, your doctor may prescribe a zinc paste bandage, zinc oxide paste, or other types of dressings and medications to aid in the healing. Skin maceration is rarely a problem if you are healthy and your skin is intact. If you have a cut or burn, follow the basic first aid guidelines, ensuring the wound neither gets dirty nor becomes overly moist. If a wound fails to heal despite your best efforts, speak with your doctor to check for possible causes. In some cases, you may require nothing more than an adjustment of the care instruction. In others, there may be an infection, circulatory disorder, or chronic condition (like diabetes) in need of special attention. Never hesitate to call your doctor if there is persistent or worsening pain, fever, chills, or any signs of infection. No matter how strong you may be, if you've undergone surgery or experienced recent illness, your body may not be able to control the infection on its own. Whitehead, F.; Giampieri, S.; Graham, T. et al. Identifying, managing and preventing skin maceration: a rapid review of the clinical evidence. J Wound Care. 2017;26(4):159. DOI: 10.12968/jowc.2017.26.4.159. Woo, K.; Beeckman, D.; and Chakravarthy, D. Management of Moisture-Associated Skin Damage: A Scoping Review. Adv Skin Wound Care. 2017;30(11):494-501. DOI:10.1097/01.ASW.0000525627.54569.da.